in an earlier post I mentioned that I'd undergone double eye surgery recently and as a result of that, I now have perfect, 20/20 vision. But going through the ops really brought home just how precious sight is and how much I depend on my eyes, not just for everyday living but for the enjoyment that crafting brings to me. Being so focused on eyesight recently, I wanted to make or rather commemorate the ops and sight. Whilst I knew what I had in mind for the design of my tag, how it actually turned out was nothing like.... my creative mojo seemed to develop a mind of its own during the making process ...... and in the end it became two tags. The colours are more golden orange than the Rusty Hinge they appear in the picture. Completely different aren't they. Ok, let me take you through the making process. I'll start with the Eye For An Eye tag because the end result made me cringe so much that I set too, to the make my second tag, the NLR tag. My starting point was a Ranger size #8 manilla tag which I covered with torn strips from the instruction sheets inside the various medication and eye drops I'd been discharged with from the clinic. To give the paper some tooth and because I didn't know if the ink on the instruction sheets would be colour fast, I applied a coat of Golden Transparent Gesso and let this dry. So far so good. 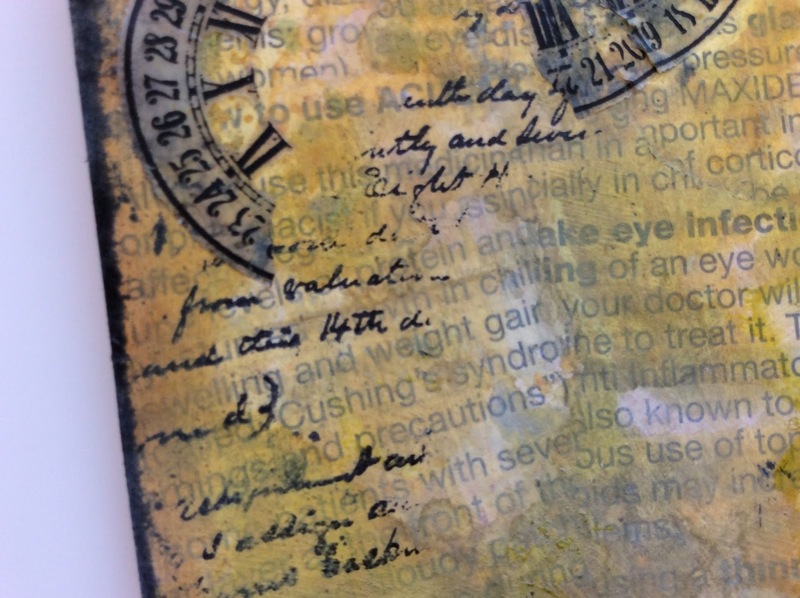 Then using Distress Oxide inks (Fossilsed Amber and Iced Spruce) I smooched the tag through the colours, drying between layers until I was satisfied with the look. What I was trying to achieve was a bright, lighter centre with a grey, hazy outline to mimic tunnel vision... Hmm that didn't work too well. Next came some splashes of Distress Stain (Spiced Marmalade) across the centre. Nope still didn't like it. Trying desperately to reassure myself that this was just the background and therefore to be built upon, I soldiered on. Using the text stamp from the Stampers Anonymous Entomology Stampset (CMS328) I randomly stamped over the background in Archival ink (black). Next I printed the two head images from one of the new Stamper Anonymous 2018 release stamp sets (Inventor 2) onto tissue paper, along with an eye chart downloaded from the internet and glued them to the tag with Ranger Matt Multi Medium. Still not happy with the direction this tag was going, out came the Ranger Remnant Rubs (Numbers). Things now went from bad to worse, as these wouldn't stick to the chalky surface and using the Ranger Matt Medium only served to move the DO paint which I mistakenly thought would be permanent once heat set.... I live and learn! By this stage the tag was pure grunge, so embracing where my mojo had taken me (and trying not to curse too vehemently) I opted for grunge, edging with Distress Inks (Vintage Photo, Black Soot) and replacing the intended focal point with a mix of Ranger Mini Gears and eye balls (surplus from an earlier project/post: Mr Ribbit). I did a bit of surgery to remove some of the plastic surrounding the iris, cutting it away with a sharp craft knife before using Glossy Accents to adhere it to the metal gear. Here's a close up to show the dimension with the eye glued in place. The sentiment is a shortened Ghandi quote. 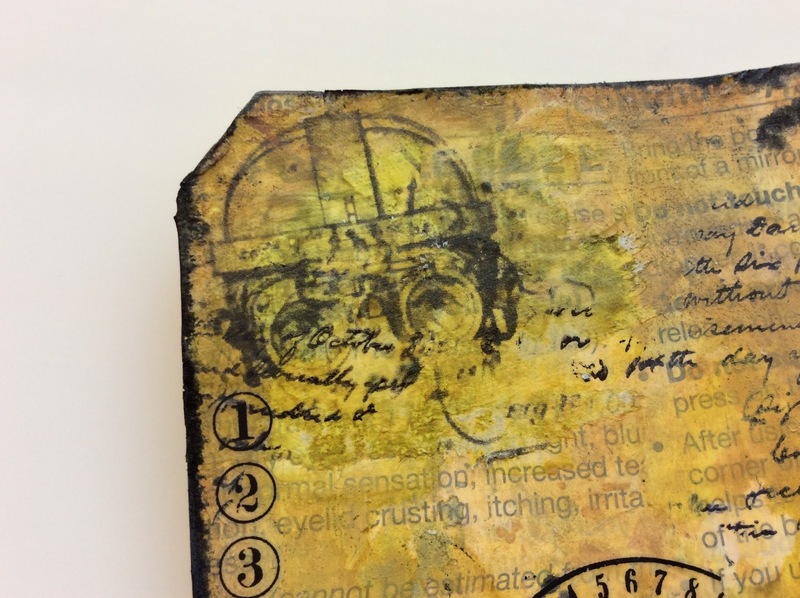 I computer generated it onto white card, edged it with Distress Ink (Vintage Photo) and backed it onto black card, before gluing it to my tag. The complimentary coloured grosgrain ribbon was from my stash. This time I used 300 gsm watercolour card and created a lighter background using a mix of Distress Oxide inks and Distress ink (Spun Sugar, Iced Spruce, Fossilised Amber) by smooching it through ink laid down on my craft mat and spritzed with water. To edge the tag I used Stamping Up markers (Tangerine tango, Pumpkin Pie, Cajun Craze) mixing each colour with water and allowing them to mix and blend as they flowed around the edges. 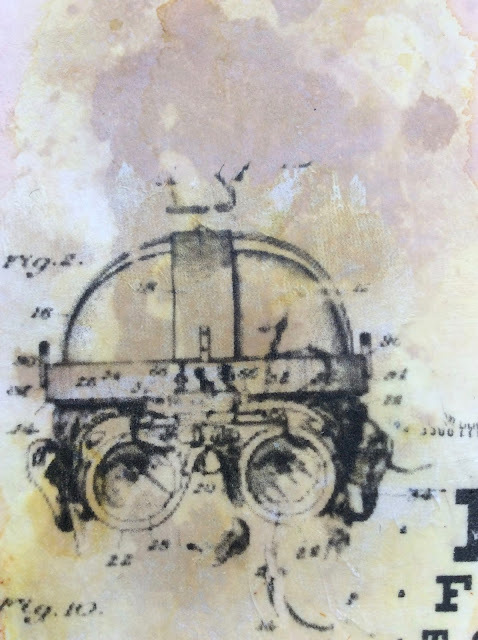 When dry I added Distress Ink (Rustry Hinge, Vintage Photo) with a blending tool. Definitely happier with how this background looked. This is in the earlier stages before I used the SU markers and DI to edge the tag. Once again I used the head images from the SA Inventor 2 stamp set and printed it onto tissue paper. 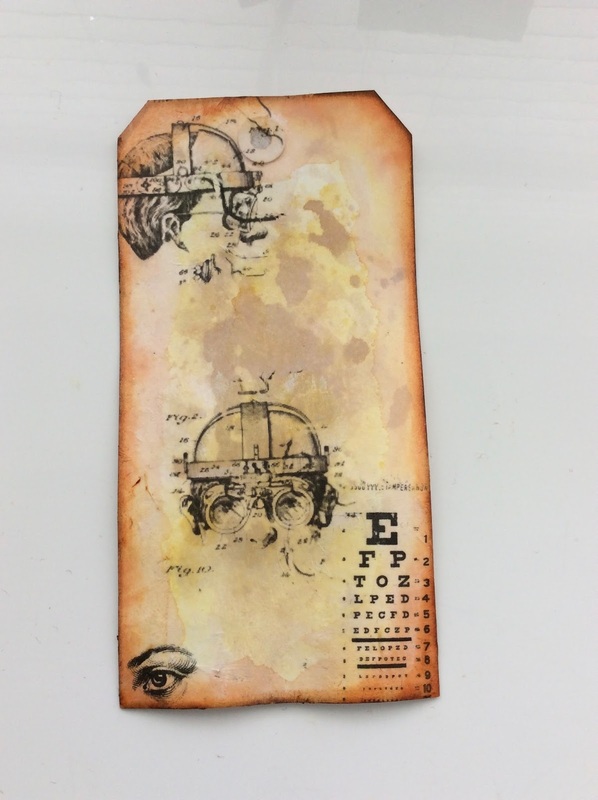 I also did this with the eye and the eye chart from the SA Oddities stamps (CSM085). The tissue paper was glued to the background with Matt Medium. This time the DO inks didn't move. My only explanation for this is perhaps the inks weren't stable on the torn medicine instruction sheets ... who know? The focal point I had planned for the earlier tag was an anatomical image of an eye ball. Copying an image from the internet, I sketched it very lightly, in pencil, onto 300 gsm watercolour paper. I retraced the pencil lines using a Micron pen (black 005). Micron pens are Archival ink in pen form which means the ink will not react with water. The eye ball was coloured using SU inks (Whisper White, Basic Grey, Old Olive), Distress Ink and marker (Peeled Paint) and SU markers (Tangerine Tango, Pumpkin Pie, Peach Parfait, Always Artichoke), then stuck to the base tag with dimensional foam pads. The chiffon and grosgrain ribbon was from my stash. 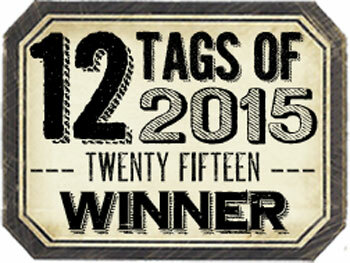 As usual I backed the tag with black card and added my tiny date tag. I was definitely much happier with the end result of the NLR tag. It was much closer to what I had envisaged in my minds eye (!) but good or bad, it all serves as a learning curve. The hazy grey shade I had originally envisaged for the edge of the tag got replaced during the making process as I felt I needed to echo the very dominant colour of the eyeball on the background, to tie the two together.